One of the many pleasures of owning an MG is the opportunity it provides to make new friends. A couple of years ago whilst competing in an Alpine event we met Kees and Inge from Holland. We have been good friends ever since. Last year they arranged for us to tour the French and Italian Alps together, so this year it was our turn. 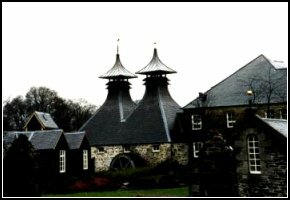 Knowing their passion for a good single malt, a tour of some whisky distilleries combined with the grandeur of the Scottish Highlands seemed an obvious choice. Clearly a motoring tour offers little opportunity to sample the local nectars, so we chose to learn the theory during the day and leave the practicals to the evenings. After a glorious sunny morning driving up the north east coast via Alnwick and Holy Island, we crossed the weather curtain into Scotland for a typical wet welcome in Edinburgh. Our first visit was appropriately to the smallest distillery in Scotland, Edradour near Pitlochry. Incredibly the entire production process is handled by just three men, using the smallest stills allowed by law (anything smaller is too easy to hide!). It was in a lovely remote and picturesque setting, friendly and welcoming, spotlessly clean and the tour was free. Here we bought the first of many bottles, which turned out to be a good move since it proved to be my favourite single malt and not generally available elsewhere. 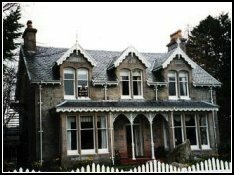 We spent a couple of nights at Moorfield House, a delightful B&B in the Boat-of-Garten. Beautifully furnished rooms on a tartan theme, an excellent chef, and a wide range of single malts with expert advice on their individual qualities, combined to make our stay superb. We have had venison filet before, but nothing quite like this. Our hosts also provided us with some priceless local knowledge about little known routes to gem locations like Lochindorb. On our first day in Speyside the weather was vile. 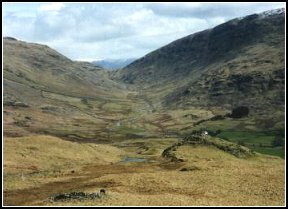 However we found some great roads, compared the mass production methods of Glenlivet with the cottage industry of Edradour, viewed countless other distilleries, and had a thorough and enjoyable theory session at Strathisla. Arriving late in the afternoon we found ourselves the only visitors there. Treated like visiting royalty, we were first given tea and shortbread in the lounge and then invited to wander unaccompanied around their elegant facility. Finally, we received instruction on how to recognise the constituent flavours of a single malt and suggestions on when each might be appropriate to drink: light flavours as an aperitif, the stronger ones for after dinner, double casks for the connoisseur etc. "Ladies' malts" have been renamed "Beginners' malts", apparently in the interests of political correctness. I thought the explanation made things worse, particularly as Inge liked all the strong ones best! In case you're wondering, 'tasting' was done with the nose, although the taste buds did get a little tickle at the end. The Chivas Regal was really quite nice - for a blend! On our second morning in Speyside the weather was even viler; it snowed, in April! The waves on Loch Ness made it look like the North Sea, and the monster very sensibly stayed at home. But in the afternoon our journey from Inverness to the Kyle of Lochalsh via Achnasheen was magnificent. The detour to Loch Maree was well worth the time and the coast roads were breathtaking, especially when taken at a brisk pace in an open top sportscar. 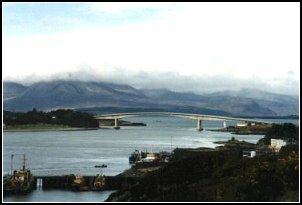 Then over the sea (bridge) to Skye. I bet Flora MacDonald didn't charge a tenner! 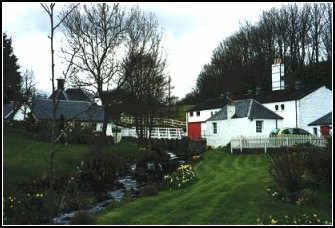 The only single malt distillery on the Isle of Skye is Talisker.  It was spotless, a symphony of stainless steel and polished copper electronically orchestrated to produce the sweet melody of their single malt. 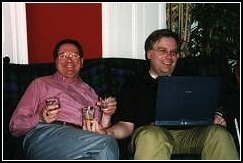 We put a few more swipes on our credit cards, especially Kees, who decided that this was a once-in-a-lifetime opportunity to upstage his whisky loving friends. 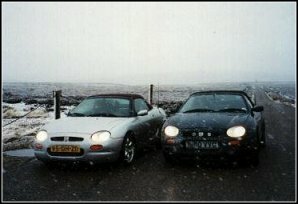 Forgetting he was spending pounds instead of Guilders (sorry, Euros), he almost overlooked the size of the MGF's boot! 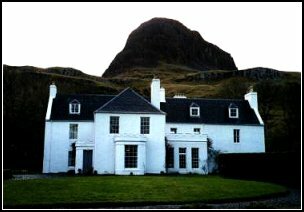 The map told me that it was only four miles from the distillery to Talisker House, our refuge and watering hole for the night. The single track road got narrower, passing places fewer, until it turned to a gravel track at the end of which was our destination, an isolated but beautifully restored manor house built in 1720 by the Clan Macleod. Only two of the four guest rooms were occupied, and once again we felt like visiting royalty. Drinks in the first floor drawing room overlooking the sea, a faultless dinner in the grand (baronial?) dining room, a comprehensively fitted bathroom the size of a bedroom, an American size bed, and real porridge for breakfast. What more could we ask for? It rained all night and my car wouldn't start. On the long drive south we stopped at the Ben Nevis distillery, where we sampled their offering. I preferred the hot chocolate in the restaurant! 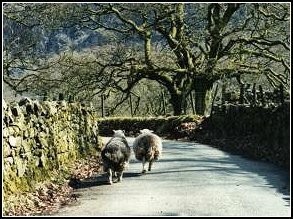 As we re-crossed the weather curtain into England the sun came out, and we spent two nights in Ambleside and a glorious sunny day in the English Lakes. I first drove over the Wrynose and Hardknott passes in a Morris 1000 when I was a student, and I find it just as exhilarating every time I do it. The beer in the pub at the end of Wast Water always tastes good. I'd like to think it is inspired by the magnificent views of Scafell Pike, but I suspect that it's because it takes so long to get there you have plenty of time to work up a thirst. We had to follow two running sheep for half a mile before they had the sense to run into a field, so our thirst was extra special! So what did we learn? That malted barley, yeast and water can be combined in a countless number of combinations. That you must wait at least ten years for a good malt. 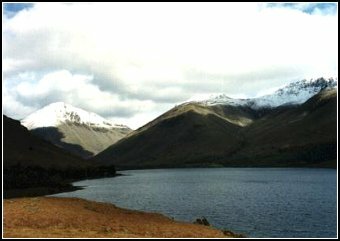 That the scenery in Scotland can really compare with the grandeur of the Alps. That you always eat and drink too much in the company of good friends.